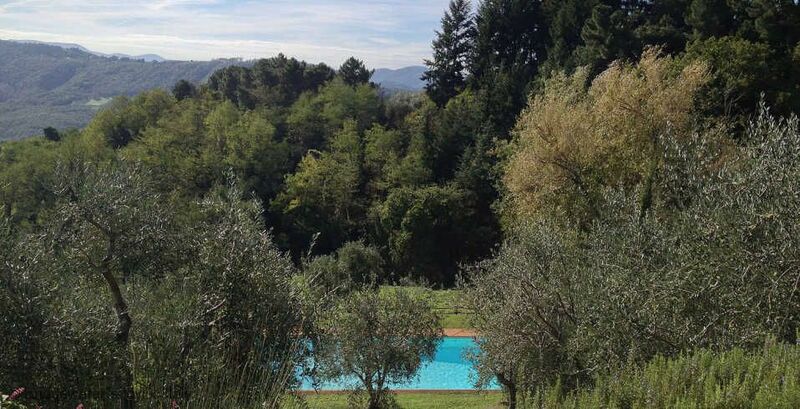 This very attractive property is located in an exceptionally panoramic position among olive groves, in the hills between Lucca and the Versilia coast. The house was meticulously restored from what were formerly an olive mill and a barn, now connected by a large entrance hall and terrace. The result is an impressive stone-built building. Attention has been given to using only traditional materials. The interiors have been tastefully furnished with great care in a country yet elegant style. The house has also been equipped with all modern facilities and each bedroom has its own en-suite bathroom. The very well groomed garden and terraces offer the guests many lovely corners where they can sit outside and enjoy the views of the countryside. The swimming pool has a salt water filter system that avoids the use of chlorine. The location of the house, the efficient insulation, and the presence of ceiling fans in every bedroom ensure that the temperature at La Sorgente remains comfortable even during the hottest nights of the summer. A particular feature of this property is that two families or groups of adults can share it, while having private space and total independence from each other. There is a 'bocce' court available for guests to use; a wonderful way to spend a summer evening whilst enjoying the panoramic views of the surrounding countryside. Ground Floor: Entrance hall; sitting room with fireplace with french windows opening on to the terrace and garden; large kitchen/dining room opening on to terrace with pergola furnished for al fresco dining; guest-bathroom; twin bedroom opening onto garden with en-suite bathroom (shower only). First Floor: Master bedroom with en-suite bathroom (bath and shower) and closet; twin bedroom with en-suite bathroom (shower only); sitting room with fireplace opening on to terrace with pergola; two double bedrooms both with en-suite bathroom (bath and shower); twin bedroom with en-suite bathroom (shower only). Maid service is included 4 hours a day, 3 days a week. Security deposit of 1000 euros payable in cash, or signed travellers, cheques upon arrival.